Canada-based Sarah Richardson has been a favorite interior designer of Hello Lovely’s audience for many years, and let’s get right to the exploration of the decorating ideas inspired by her interior design, decor choices, and unique sensibilities. Isn’t this bold blue hall (above) in Sarah Richardson’s off-the-grid Ontario home happy and inviting? Such a good lesson for us all since such areas of the home are often aesthetically inferior even though they are used frequently. 50 Stunning Sarah Richardson Decorating Ideas! 2. Vintage Door as Sliding Barn Door. I wish I had a dollar for how many emails I receive asking for the paint color on Sarah Richardson’s amazing vintage sliding barn door with its turquoise lovely paint! I haven’t yet discovered whether the weathering and paint are original or faux, but isn’t this entrance to the laundry room in her family’s off-the-grid house in Ontario extra special? Sarah Richardson’s farmhouse living room feels sumptuous with all the warmth from the red decor including wool rugs, velvet pillows, and throws. The coat of arms above the fireplace mantel is a showstopper too. The elegance factor is heightened with the seagrass wallcovering you may not expect to see in a country house with so much whitewashed knotty wood and other rustic home decor details. 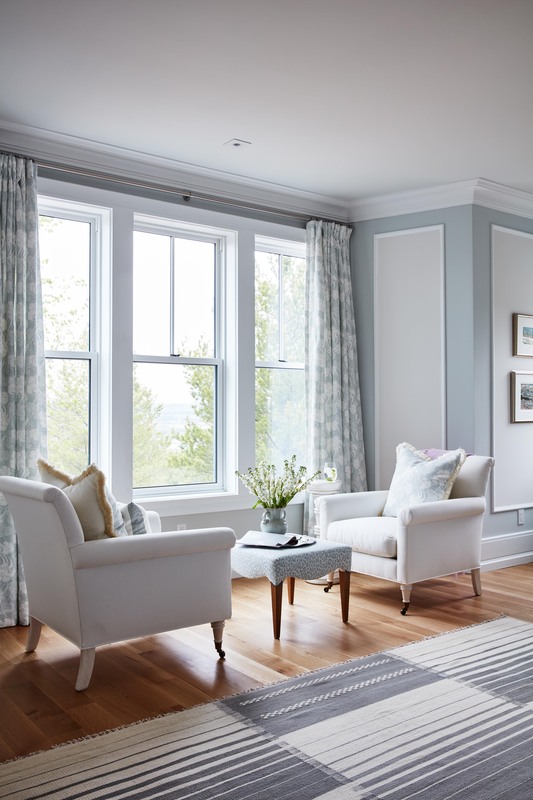 This is what Sarah excels at: creating elegance in a room that remains approachable and inviting. 4. Create Opportunities for Intimacy. 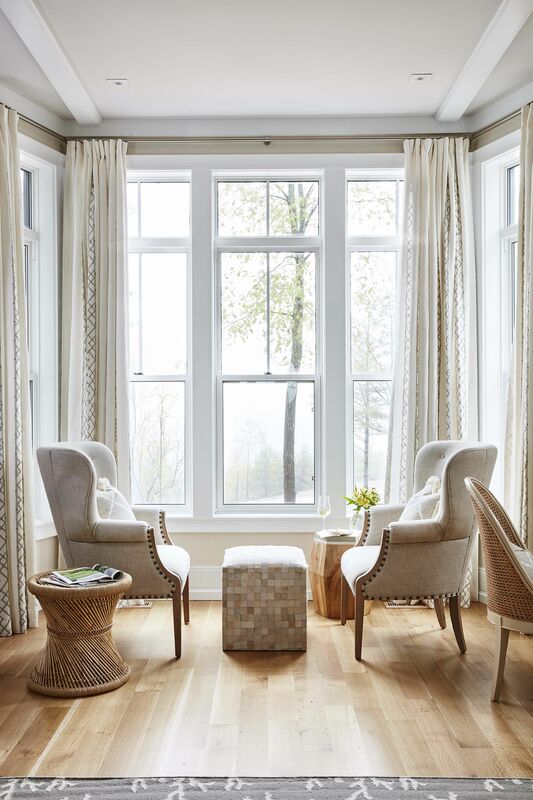 This serenely quiet conversation area with neutral home decor in a cozy section of Sarah’s living room is one I could stare at for a long time. It captures the imagination since there is so much calm, and even in this small space, Sarah has introduced textures of rattan, buttery leather, exotic wood, linen, and character-lovely wood. The setting for this home has breathtaking views (it’s her family’s country home in Ontario), and the color outside pairs magnificently with the subdued interior design. 5. Splurge on Classic Details. 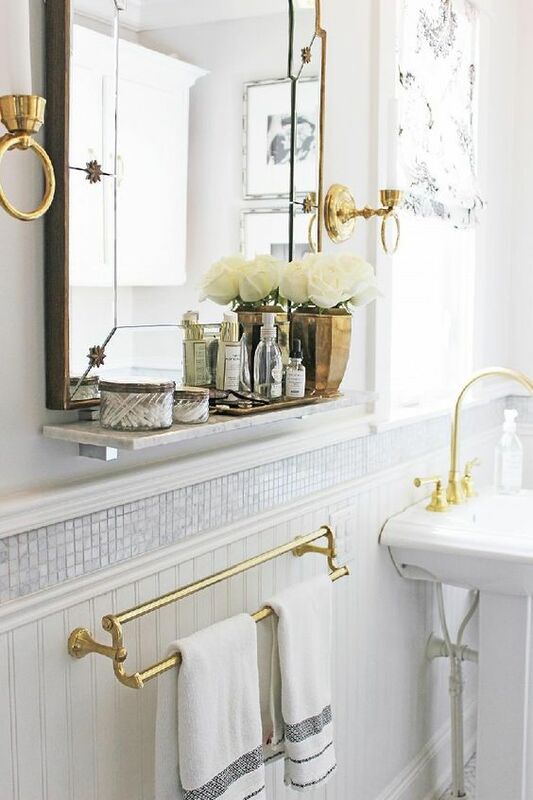 In this Victorian-era bathroom above, beadboard on the walls, classic millwork, and vintage-style brass bathroom fixtures combine with brilliant design from Sarah for the tile. A mosaic above the chair rail looks classic yet a bit unexpected, and the marble shelf is both functional and beautiful for holding luxurious bath items and decor. 6. Modern Country Need Not Be Rustic. Sarah Richardson’s own kitchen in her off-the-grid house is brimming with fresh ideas on her vision of modern country style. Most of us imagining a country kitchen with a wood stove would not envision the elegant decor and finishes we see here. There’s no giant harvest table, no rustic farmhouse signs, no vintage corbels or antique plates on the wall. Instead, she has surprised us with sleek custom brass accent panels, a refined breakfast dining area with modern upholstered dining chairs. Even the color palette feels more cool and Paris chic than say Nashville lovely (there isn’t even a rug in the space…though there is a “stone rug” between the island and range wall). 7. 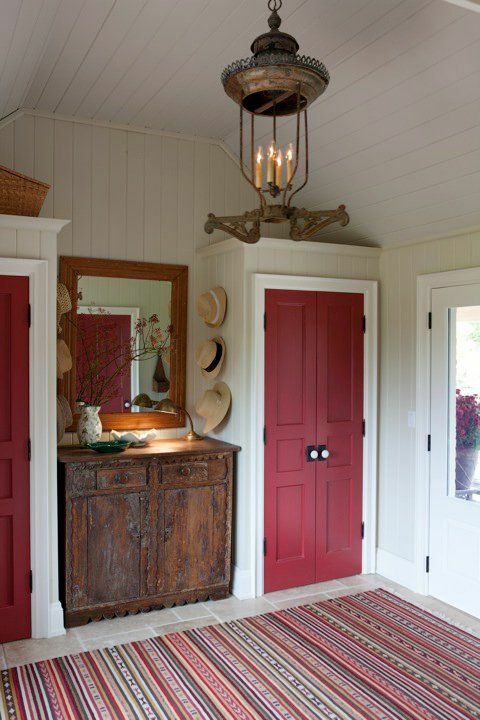 Vintage Doors Can Be Showstoppers. 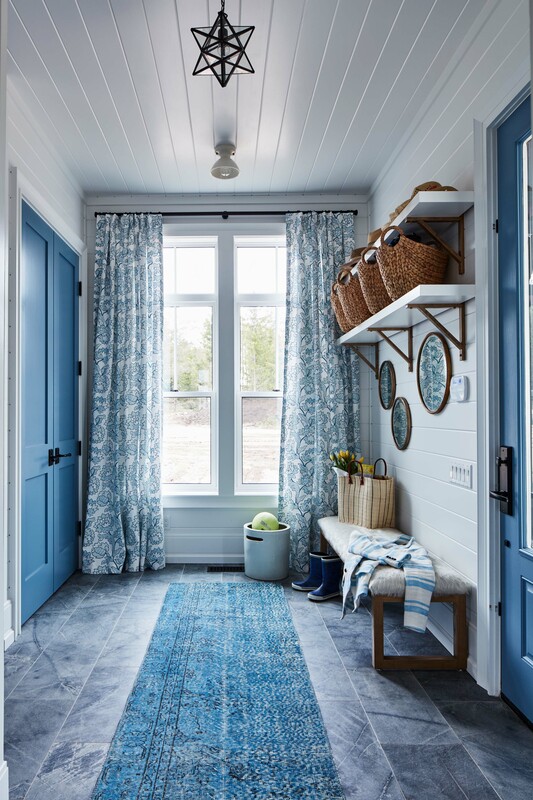 For long-time Sarah Richardson fans like me, we recall vividly watching Sarah design this farmhouse with its charming entry/mudroom on her HGTV show. On the show, we were taken along on her flea market jaunts to source the home decor and furniture, and it was such a learning experience, wasn’t it? The rosy red of these doors on twin closets, the nook for the cupboard, and that vivid striped rug surely make this one of the most re-pinned Sarah Richardson design moments in history. What a welcoming entry! The alder doors in my own home aren’t vintage but are suggestive of age. 8. Airy Chairs Balance a Heavy Table. 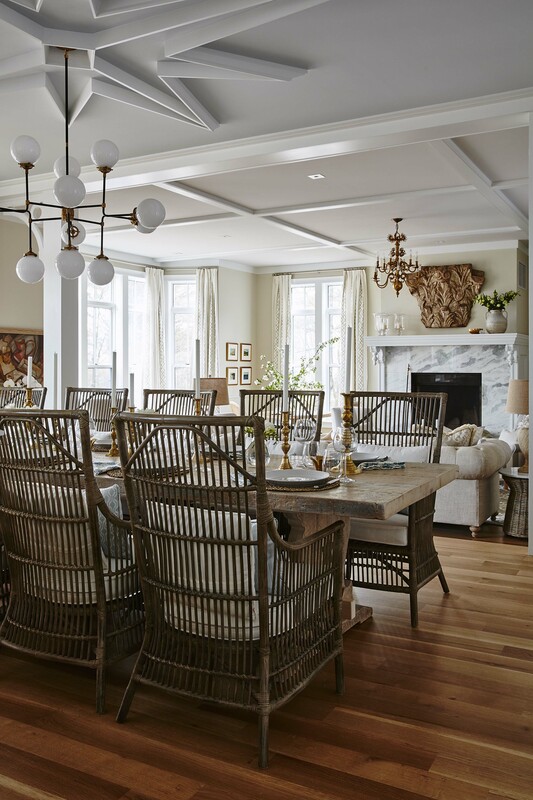 These airy open weave rattan high back dining chairs in Sarah Richardson’s own dining room, adjacent to the living room add a a rustic yet light layer of casual comfort to this room’s design in her off-the-grid Ontario home. Pssst. Find the exact light fixture in that post too! Where you might expect to see Windsor style dining chairs or even upholstered Parsons chairs for softness, Sarah has chosen a handsome natural option which you might expect to see on a covered porch or in a beach house. For me, they say “vacation!” which is a lovely invitation to elevate both the everyday and special dinners shared with family and friends. 9. Vintage Style Chests Make Amazing Vanities. 10. Blue-Grey is Magically Tranquil. Sarah Richardson knows her way around fabric prints, and she mixes them with bold genius. 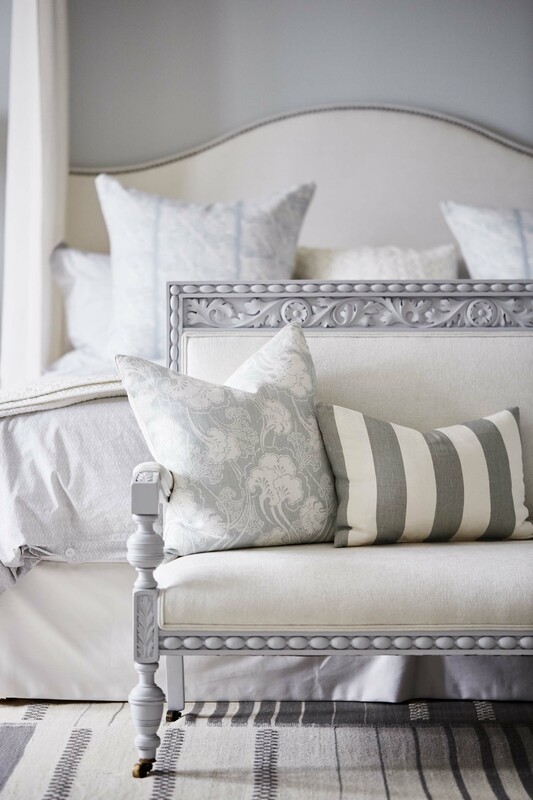 While we often see other designers do this adeptly with bold color, you don’t often see quieter, subdued, and more neutral shades mixed as we see here in Sarah’s serene blue-grey master bedroom with European inspired furnishings and home decor. Quiet color need not be bland and snoozy (although what’s so wrong with snoozy in a bedroom!?!) if your personal style is on the more dynamic end of the spectrum. 11. American Country Decor Can Feel Fresh. Sarah Richardson’s interior design style has never shied away from bold color like the red and blue happy punches in this bedroom. She has combined stripes, gingham, stars, paisley, and crosses, yet it doesn’t feel overwhelming or overstimulating. 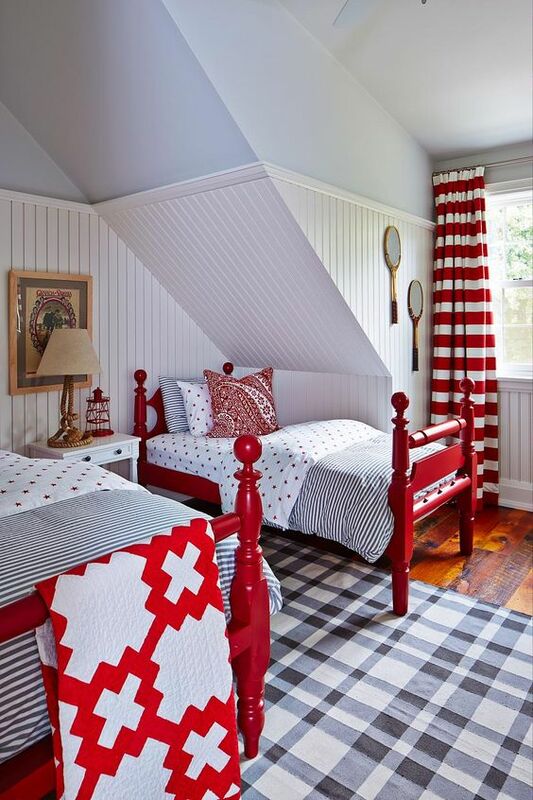 There is enough white to balance and contrast, and the bold red painted cottage style beds get to shine as stars of the room. The home decor and design of this craft room has a similar happy boldness. Accent Mirror 50 Stunning Sarah Richardson Decorating Ideas! 12. Vary Textures on the Walls. While it can be a daunting task to choose wallpaper for a public space like this entry in Sarah’s own family home, she repeatedly demonstrates in her interior design projects how it’s an important layer in the big picture. This subtle wallcovering adds an ethereal elegance that feels very modern when combined with the more traditional wood flooring and shiplap walls. 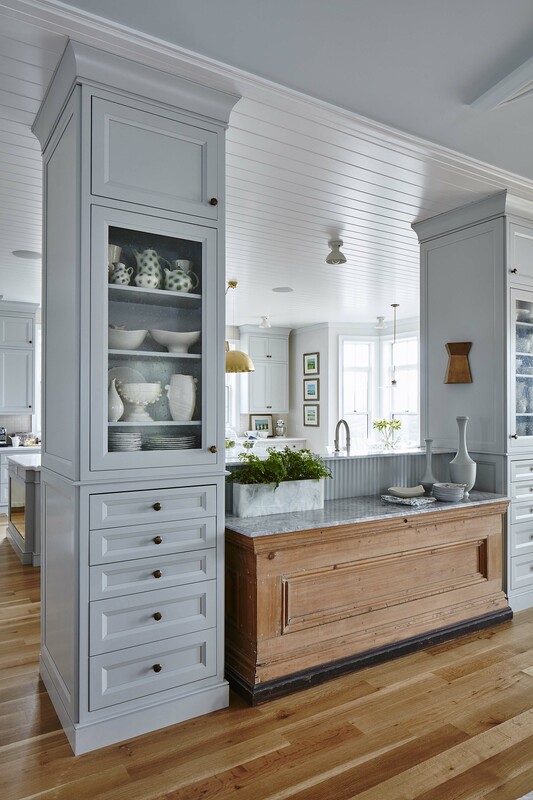 Sarah Richardson has also not played it safe in her mixing of blues as you’ll spy navy, slate, and turquoise in close proximity to one another. In most cases, homeowners do not seem to feel that same freedom to mix rather than match, and yet for an evolved over time look, it’s precisely such freedom which creates that desired outcome. 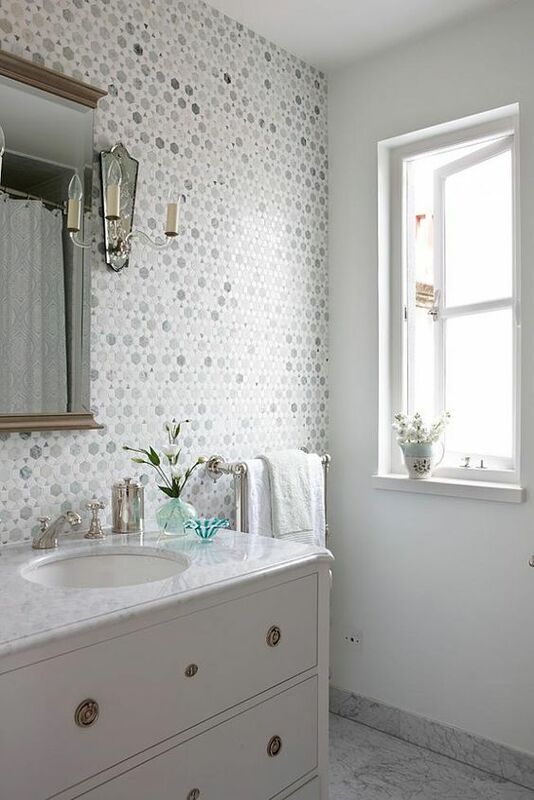 Marble Mosaic Tile: FIND HERE 50 Stunning Sarah Richardson Decorating Ideas! 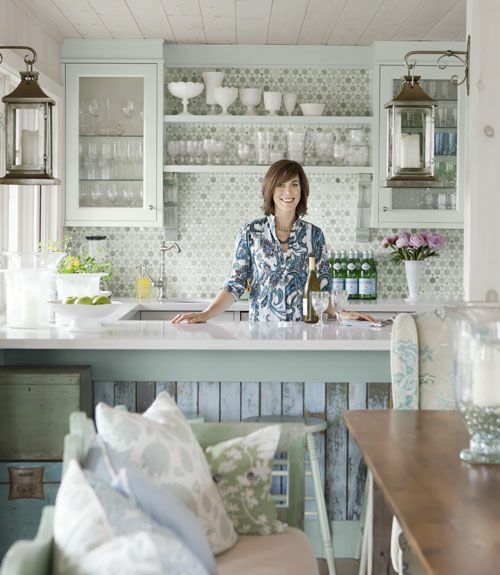 Hello Lovely readers went nuts and Pin-crazy back in 2010 when I shared Sarah Richardson’s cottage with this little kitchen done in Sarah’s favorite blue-green palette. The waterfront property surely inspired all the watery colors and aqua accents like the marble mosaic backsplash. You may remember Sarah whitewashed all the knotty paneling which she inherited with the property. The pastels in this cottage style kitchen, dining area, and living room made a huge splash with lovers of vintage style and shabby chic! 14. Design Creates Backdrops for Memories. As we saw in an earlier vignette above, Sarah Richardson places comfy armchairs at the ready for face to face conversations, which creates an altogether different effect than tucking a single upholstered chair in a nook with a task lamp for reading. Maybe you see a simple conversational area with a killer view through the window. What I see in this furniture arrangement is intentional space made for relationship, intimacy, and lovely discussions. Designer Pam Pierce masterfully creates such arrangements. 15. Pairs of Chairs for Cozy Factor. Blue and white are surely Sarah Richardson’s best friends, and she has been celebrating the pairing in fresh beautiful ways for decades. 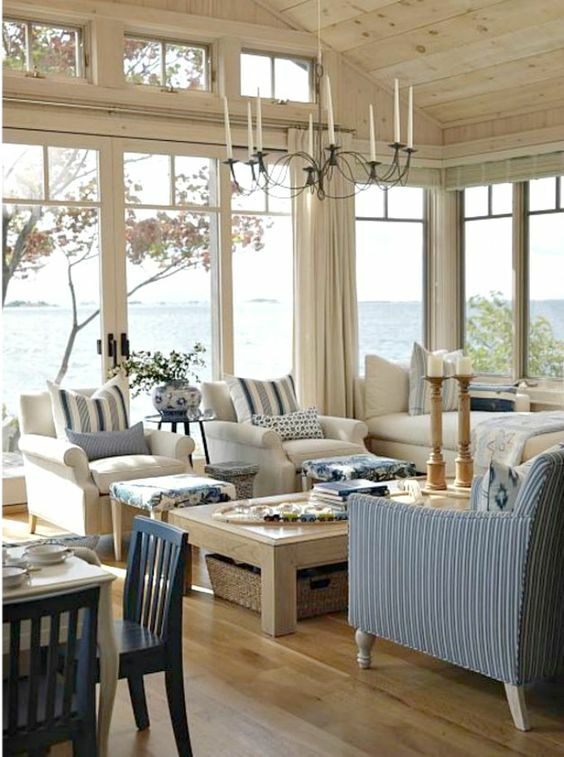 In this waterfront home, blue seems right at home, and comfort abounds (notice the darling ottomans encouraging lounging!). In an era where open concept kitchens are touted as the ideal since kitchens are typically the hub of modern living and entertaining, Sarah put her own spin on open concept. Towers of cabinetry flank a buffet, providing a separation from the dining area and family room. 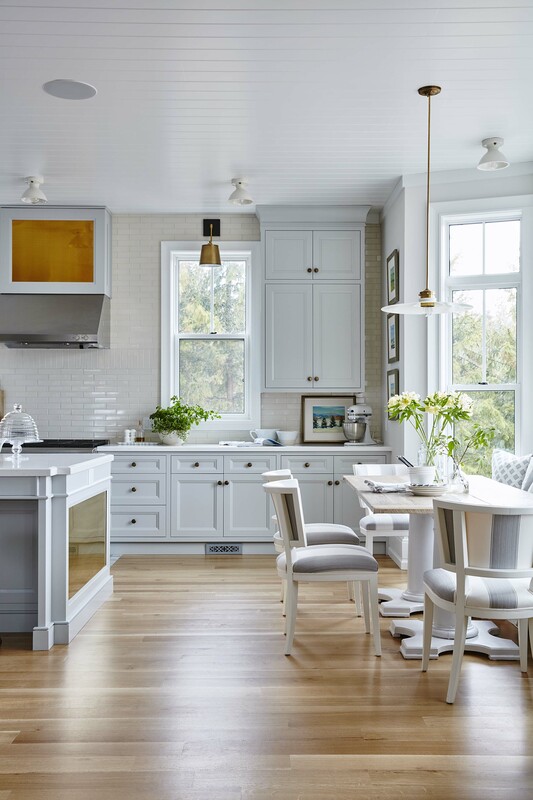 Truth be told, Sarah’s kitchen is spacious with several zones for living and dining in itself, but this design decision does reinforce a more traditional style design. 12-Light Sputnik Chandelier 50 Stunning Sarah Richardson Decorating Ideas! Country modern may sound like an oxymoron to a lot of folks, but surely, Sarah shows us how it can be achieved in her Ontario dining room. 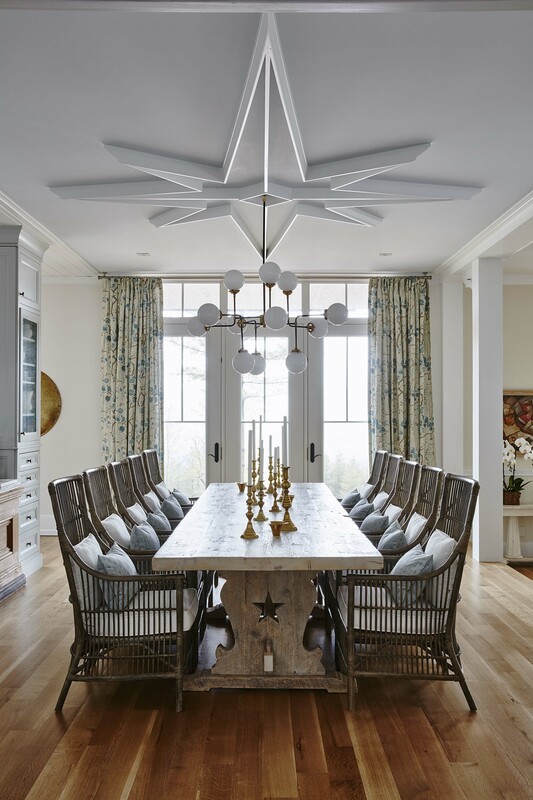 A chic Sputnik chandelier is both retro cool and minimally modern, and it’s maybe not the first light fixture you would dream of illuminating this rustic vintage Mountain-lodge feeling dining table. 50 Stunning Sarah Richardson Decorating Ideas to! 18. Turn to Sherbet and Candy for Festive Inspiration. Coral, orange, and raspberry sherbet hues for Christmas decorating? Of course. 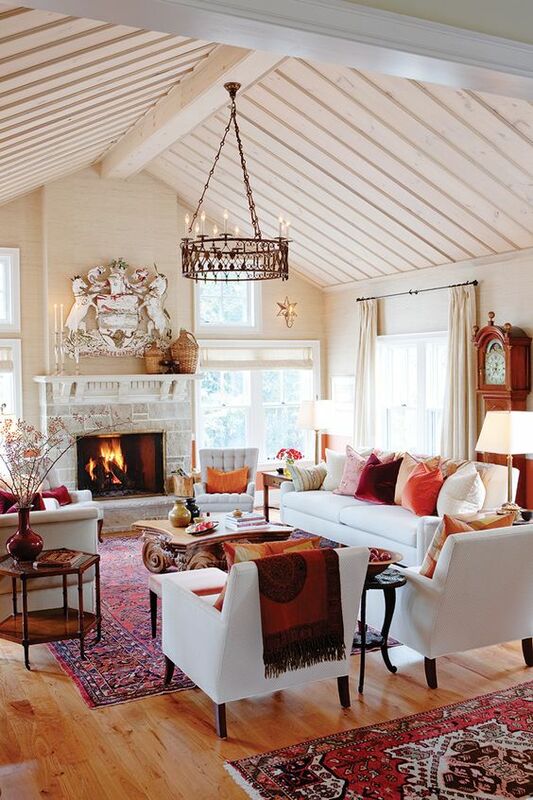 Sarah Richardson knows her way around colors that make everyone feel warm and welcome. 19. Make the Laundry Room Multipurpose. So much to learn from Sarah Richardson’s interior design choices for her own laundry room in their off-the-grid home in Ontario. The space is open, with storage and cabinetry around the perimeter of the room and the washer and dryer stacked. The desk is functional for getting work or homework done, but cleared, it seems to me the surface could be utilized for folding laundry. The rug keeps it feeling elegant and interesting, and I bet most of us would never dream of leaving those windows naked! 20. A Timeless Bath is a Wise Investment. 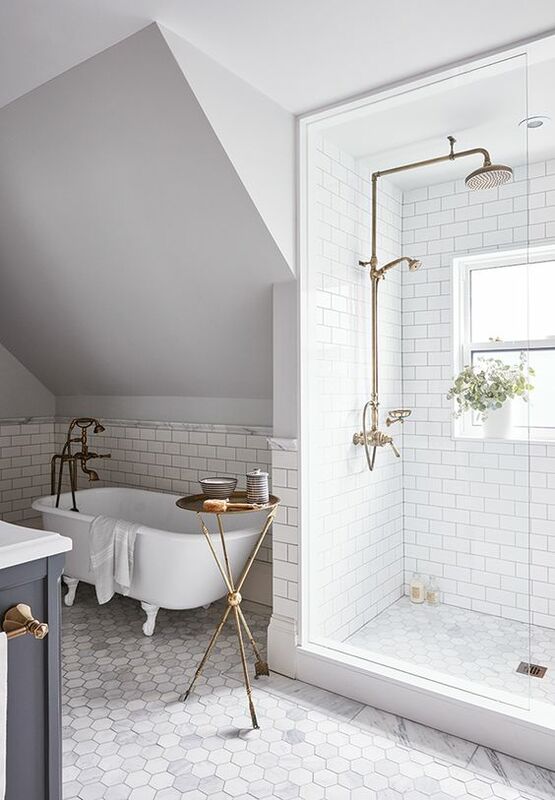 More hex tiles from Sarah in this vintage style bathroom with a modern, clean feel, and I love the way she has used vintage-style shower and bath fixtures to impart a classic and timeless vibe. I love the clawfoot tub in my own vintage-style bathroom with a similar vibe. PART 2 is right here. What a wealth of home decor and interior design inspiration from Sarah’s portfolio! I hope you found pretty moments to pin, and PART 2 is destined to promise more beauty and imagination. She makes her spaces look so spacious and welcoming like you’d want to spend time there. I love that big multipurpose laundry room. Very Sarah! Yes. You don’t see many laundry rooms designed cleverly as a pleasant office or craft room. Happy weekend, friend! 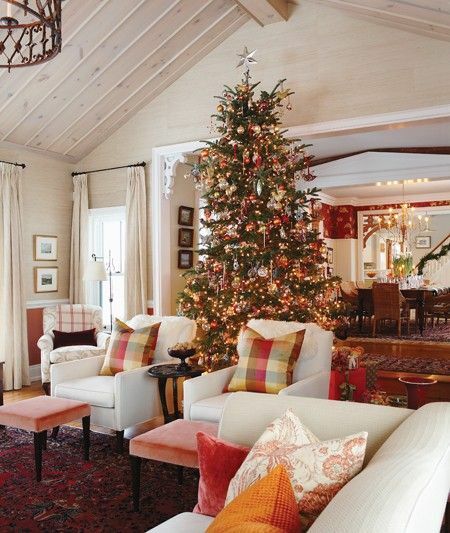 i have never particularly been a “reds” person when decorating, except for some accents…. but i absolutely LOVE everything red in her home…. and the mixture of all of her blues is wonderful….. thanks for the photos and your comments!! Nobody decorates quite like Sarah. She knows how to make a home feel cozy while still elegant. I particularly like the feel of the laundry room. I would never have thought to put a lovely rug in there but it really elevates a workroom to a space you would want to spend time in. Thank you for sharing all the details – large and small. Everything Sarah designs is beautiful! Why or why can’t we get her design show in the U. S. anymore? I had forgotten some of these spaces from her previous programs. Such a lovely reminder of Sarah’s unbelievable talents. Thank you for sharing these beautiful images, Michele! Can you post a source for the dining chairs, I love them!